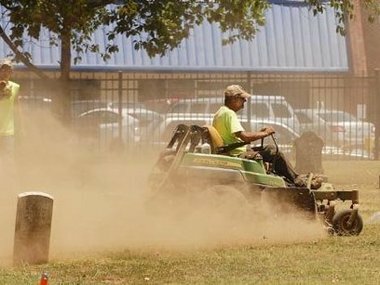 Parts of Birmingham area officially in drought | al.com: BIRMINGHAM, Alabama -- As if the extreme heat wasn't enough, portions of the metro area are now officially in drought, according to the U.S. Drought Monitor published Thursday. According to the National Weather Service, temperatures are predicted to reach 99 degrees today and climb to 102 Saturday. Temperatures near or into the triple digits with only slight chances of rain are expected through Tuesday. Trapped under a ridge of high pressure, the stagnation and searing temperatures also are creating unhealthy air quality. Wednesday and Thursday both were code orange air quality alert days, and the high ozone levels are expected to persist today. The Jefferson County Health Department advises that active children and adults, and people with lung disease such as asthma, reduce prolonged or heavy exertion outdoors.